Does it look delicious, but you really shouldn’t take a nibble? Maybe it’s Fake Delicious. 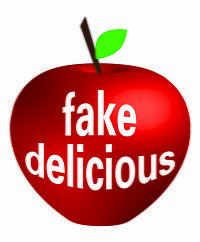 Fake Delicious is a blog of food themed things that just aren’t edible. Initially I tried to do a post a day for a year. That failed miserably, but since there are still awesomely Fake Delicious things I’m gonna keep trying. Stats: 23 queries. 0.340 seconds. Valid XHTML, Valid CSS, XFN. "Red Delicious" theme by Nicki Faulk.